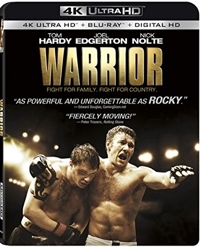 I’m not a betting man, but if I were, I would have bet against Warrior, a 2011 sports drama from writer-director Gavin O’Connor. I would not have believed that an old-style boxing (mixed martial arts, actually) film could successfully appropriate the Rocky Philadelphia setting, the Rocky notion of an underdog who’s out of his league, the Rocky subplot of a woman in the boxer’s life not wanting him to fight, and a Russian champion who comes to the U.S. for “the big fight” . . . and put it all together in a package that’s just as engrossing and exciting as that 1976 benchmark boxing film. It helps that the plot turns on a former alcoholic boxer and boxing trainer who is estranged from his two adult sons, and that Nick Nolte plays the father, Paddy Conlon. It helps too that Tom Hardy plays the younger brother, an intense young man who holds a grudge against his older high-school-teacher brother, Brendon (Joel Edgerton). The performances of the three male leads are searing and help to elevate a film that throws every boxing cliché into the ring. Yes, we’ve seen it all before, but not like this. The characters may be familiar types, but each actor brings something new to the formula. Warrior runs a hefty 140 minutes, but it never drags. 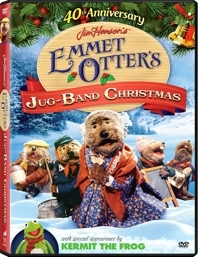 With Emmet Otter’s Jug-Band Christmas that’s absolutely true. Jim Henson and his Muppeteers used traditional hand-operated puppets, string-manipulated marionettes, and remote controlled Muppetry to make this 1977 TV Christmas special. It’s hard not to have some reaction when you watch Emmet rowing his mother across real water while Ma sings about the good old days. But it could seem so totally new to today’s youngsters that they may not even be sure how to react. What they’re watching is a lost art, with such detailed sets and models and characters that you have to feel charmed by the whole process. And that rowing scene? It’s the equivalent of watching a ventriloquist work his dummy while drinking a glass of water. 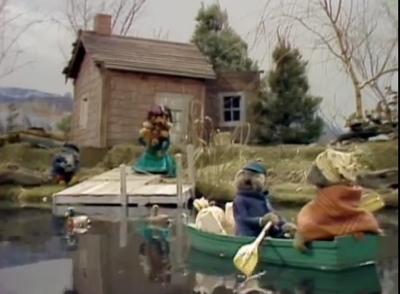 Such technical wizardry abounds in Emmet Otter’s Jug-Band Christmas. Henson enlisted composer Paul Williams to create the songs for this 48-minute film, which he told Williams was a “trial run” before he went all-out to make a full-length feature film. That means fans of The Muppet Show and The Muppet Movie will find this especially fascinating. You can see what Henson thought worked and what he thought needed to be juiced up a bit in order to be effective in the theaters. Emmet Otter looks a bit like an Ewok, and he’s cute as the Dickens. He and his Ma are both good singers, but, like everyone else in their watery corner of the world, poor as can be. When they see signs for a talent show featuring a $50 prize, they both decide to enter because, shades of O. Henry’s “Gift of the Magi,” each wants to buy a Christmas present for the other. While Ma practices her solo, Emmet gets his musical friends together to form a jug band. But while they all are performing old-time music, that prize money starts to look like a pipe dream when a bunch of kids with electric guitars are cranking out tough-to-beat rock music. That’s how Frank Capra’s 1937 adaptation of James Hilton’s novel begins, and it’s a tip-off that despite an action-packed opening evacuation scene set in China, a plane crash that delivers the original Lost passengers to an isolated place that’s cloaked in mystery, and a mountain sequence involving a massive avalanche and harrowing escape, Lost Horizon is more of a heady melodrama than it is a typical adventure film. And that means that while it may be perfectly suitable for the whole family to watch, it will most likely interest only families with children in their later years of high school. Capra (It’s a Wonderful Life, Mr. Smith Goes to Washington) skips the frame story and jumps right into the evacuation of “white people” who are being evacuated. Hilton’s novel was set in a different time and place, but with war brewing Capra set it in more familiar—and, for 1937 audiences, more disturbing—territory. When diplomat Hugh Conway (renamed Robert for the film) leaves on the last plane with four other people and their plane is crash-landed in the Tibetan mountains, they make their way to the only shelter around: Shangri-La, a lamasery that’s completely cut off from the outside world, and where everyone is happy no matter what work they do. Once there, the main dramatic questions for each character become: Were they kidnapped or were they rescued? Should they stay or should they go? Shangri-La beckons some, but repels others. The five travelers offer the same sort of variety as viewers would see two years later in Stagecoach. Joining Conway (Ronald Coleman) is his impetuous brother George (John Howard), mild-mannered paleontologist Alexander Lovett (Edward Everett Horton), con-artist Henry Barnard (Thomas Mitchell, who played Uncle Billy in It’s a Wonderful Life and the drunken doctor in Stagecoach), and a sarcastic woman named Gloria (Isabel Jewell) who discovers that her terminal illness seems to go into remission once they reach and spend time in Shangri-La. Given the CGI world we now live in, the sets seem average, but back in 1937 they were impressive enough for all critics to notice, and the cityscape sets took five years to build. 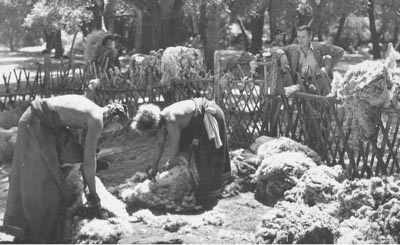 But there was a rural component to this as well, which, for all its utopian pretenses, feels remarkably feudal. The High Lama creates a world where all the people are happy, even as they work at different jobs to contribute to society. It’s not just that everyone in Shangri-La lives in peace and harmony. They also have everything they need, obtained over time because the mountains around them are full of gold. And for the child philosophers in your families, therein lies the film’s main contradiction that’s worth talking about. But the film’s main philosophical question is also discussion-worthy: would you want to live in a place that’s isolated from the world if doing so would enable you to live a hundred, even two hundred years? And what would you do for love? Would you stay in a place like that to be with Sondra (Jane Wyatt), as Conway contemplates? Would you leave, as Maria (Margo) does, risking life itself to be with someone you loved? And why is it that utopias always fail? Is it human nature? Is it the nature of life itself? 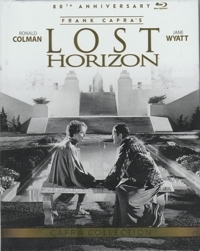 Lost Horizon is a thought-provoking drama that’s worth watching if for no other reason than to be aware of this culturally significant film. It did, after all, give us the name “Shangri-La,” which has since become synonymous with a utopian paradise on earth. Our family loved Pirates of the Caribbean when it was only a theme park ride. So when Pirates of the Caribbean: Curse of the Black Pearl appeared in 2003, we happily climbed aboard. It turned out to be a fantastically original and fun film that felt like a ride, with Johnny Depp creating a pirate captain like we’ve never seen before: a rum-loving, slightly swishy ne’er-do-well who is simultaneously the worst and best pirate anyone has ever seen. Captain Jack Sparrow. But success in Hollywood is a curse in itself, dooming actors in highly successful blockbusters to repeat their roles over and over. 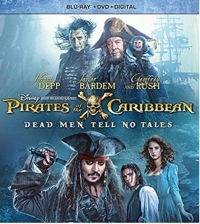 Pirates of the Caribbean: Dead Men Tell No Tales is the fifth in the franchise, and I will say this: our family liked it better than the fourth (Pirates of the Caribbean: On Stranger Tides, 2011). Though some of the fantasy elements are still as confusing as they’ve been in other sequels, Dead Men Tell No Tales at least has some fun action scenes, some great special effects (like undead sharks attacking) and two very likable young leads that inject new blood into the franchise. That’s a double-edged cutlass, though, because as filmgoers your gut tells you that this series ought to have stopped after the first trilogy. Now, with two new characters to drive the action, the series probably won’t end with #5—though it will never catch the all-time sequels leader, Godzilla, which has spawned 29 movie offspring. But back to what makes the film work. Newcomers Brenton Thwaites and Kaya Scodelario are as refreshing as Felicity Jones and Diego Luna were in Rogue One—just the kind of jolt that a storied franchise needs. As an astrologer accused of witchcraft and the son of pirate Will Turner, both of them looking for fathers, they have good chemistry together and capture the light tone of the first film. 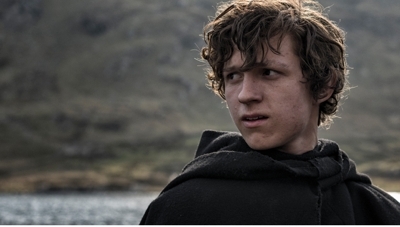 Pilgrimage is an average movie with above-average atmosphere and cinematography, thanks largely to the Irish landscapes where it was mostly filmed. It’s also a movie that plods along into eye-rolling territory until, suddenly, there’s a burst of violent (some would call it ultra-violent) action. Though it’s billed as a medieval thriller, this Jekyll-Hyde movie lurches between tedium and frenetic action, while viewers may well wish that the filmmakers had opted for some sort of happy medium. The plot is simple: an emissary from Rome shows up at an Irish monastery in remote Western Ireland with instructions to take a holy relic back to the Pope, who believes it has enough power to end the Crusades. An opening scene showed just how that relic came to become “holy”: it was the large rock that ended the life of a Christian martyr who was being stoned for his beliefs. Fast-forward to 1202 A.D. and Brother Geraldus (Stanley Weber) shows up in a white robe asking for the relic.